Suzanne gave birth to our son Jett Brian Hoover this morning. Both mother and son are doing well. Oh I really must get one of these. This will be sold at the upcoming Celebration 3 shindig in the US this year, kinda like the old Jorg Sacul from the last one. This one looks very cool, and also has the cheesy ability to speak a few lines. I need to make a friend real fast on the message boards so he can get one for me and send it to me. This will probably be the new centrepice of my Darth Vader collection for a while. 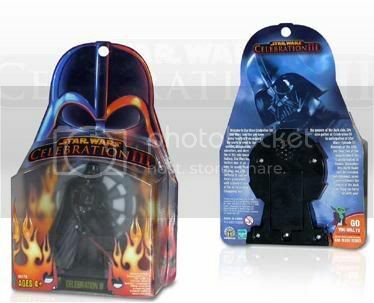 The thing with the new packaging for the ROTS figures is that they may not fit into Star Cases. From the looks of this figure, it may. 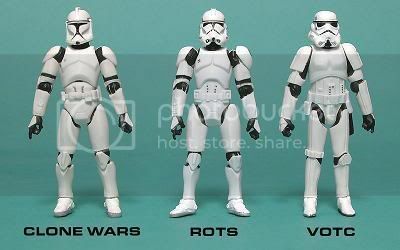 If all the ROTS figures are different to this then I might be outta luck. OK, so the pics of the new Episode 3 Republic Trooper have been out for a while, but I haven’t seen this comparrison shot before courtesy of Galactic Hunter. I wondered how they would make the leap from the Clone Wars armour to the Empire armour, but this one looks quite good. The articulation on the actual figure is quite astounding, but what I am admiring here is the design. This guy looks quite manacing. The US has abandoned its hunt for weapons of mass destruction in Iraq, ending its search for the arms stockpiles that were the key justification for the US-led coalition’s invasion of the country in 2002. Whew, Andrew Gaze is playing his 600th game tonight. 600 games in professional sports. Alright, the NBL season is a short one with between 26 and 32 games depending on the year, but still he has been playing NBL for the Tigers since 1984. It’s now 2005. Get this, Melbourne finished the 1987 season in 14th and last place with a 3-23 win-loss record. Imagine the club’s plight were it not for the unbelievable scoring of Gaze that year. He scored a season-high 60, reached 50 on six occasions and racked up 40-plus points 10 times. Gaze’s season-low, if you could call it that, was a pair of 30s. His season average of 44.1 points per game is a league best, ahead of Al Green on 39.5. This is just one of the many heroics of Gaze. He played his 599th last weekend in Perth, but we are on a budget so I wasn’t able to go. I would have liked to have gone. One of my memories of Gaze was watching him abuse the Perth Wildcats in 1997 or 1998. He scored 26 points in the first quarter. I was wearing my replica Gaze #10 warmup top in the third row, centre court so everyone could see who I was supporting. Unfortunately at the end of the first quarter I ended up also wearing a large Coke someone threw at me, but it was worth it. As the hecklers pointed out at the end of the game, Gaze ended up being ‘held’ to 45 points so that somehow made his performance insignificant. Stupid Perth Wildcats supporters. Ah, NBL memories. I can’t remember the exact year, but one game I loved was where the Tigers came from 19 points down at 3/4 time to pip the Magic on the buzzer. Magic hit the first two shots of the fourth quarter so they were 23 up. But little by little the tigers clawed their way back and with a few seconds left they were only two down. Who should get the ball but Lanard Copeland on the break, who had hit only two field goals all night. He was having a dog of a game. I thought, “Give it to Gaze!” who at this stage was parallel with Copes running the middle lane with only one opponent to beat. But Copeland backed himself. He faked a dribble left, took one step right and shot from 45 on the arc. This was a game where I had almost decided to go to bed at 3.4 time. It ended up being one of the most memorable games I have ever seen. Just goes to show, eh. I’ve been on the phone to Three so far for 32 minutes waiting to change the address they send my bills to for one phone, and inquire about the billing for the other phone. When we upgraded our old NEC video phones to the new Motorola A835, we were supposed to both get a $300 credit but we only got that on one phone.